Very Corny Holiday | We Like to Cook! Since Lincoln issued his first National Thanksgiving Proclamation in 1863 declaring the last Thursday of November as a national holiday, Americans have celebrated the annual feast by cooking traditional foods such as turkey, various types of squash and corn. Corn is a truly American commodity and has been found in North American fossils of pre-Ice age. Even before Columbus landed in the New World, corn was the staple grain of Native Americans who called it “mais” which meant “our life.” In Plymouth, Native Americans taught the Pilgrims how to cultivate corn by planting a fish among the seeds and how to harvest. They also taught the newcomers how to cook with corn by adding a pinch of ash to release more nutrients. 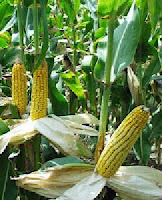 In the early years of most colonies like Plymouth and Jamestown, corn was the key to survival. While colonists originally ate corn out of necessity, it later became the food of choice in most Colonial recipes and meals because of its vast versatility. 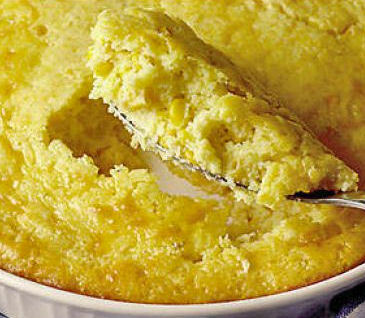 Spoon bread made with corn meal is a traditional Thanksgiving side dish. Its pudding like consistency will make it a favorite with the entire family. This was always the recipe our boys would ask us to make for school Thanksgiving celebrations; it was always a big hit. Preheat oven to 350o F. Heat milk in a saucepan but do not boil. Mix together cornmeal, sugar, and salt and slowly stir into heated milk. Continue stirring over low heat. Add butter to the mixture and stir. Remove from heat and allow to cool. In a separate bowl, beat egg whites to soft peaks and set aside. Stir egg yolks which have been lightly beaten and baking powder into the cornmeal mixture. Then gently fold egg whites into cornmeal batter. Stir lightly so as not to deflate the egg whites. Pour mixture into a greased 1½ quart baking dish. Bake for 30 to 35 minutes, until the top is golden. Serve immediately. *To appeal to younger palates, add a little maple syrup.